Fill your home and your nostrils with the delicious blend of sweet orange, basil and frankincense for forty happy hours. 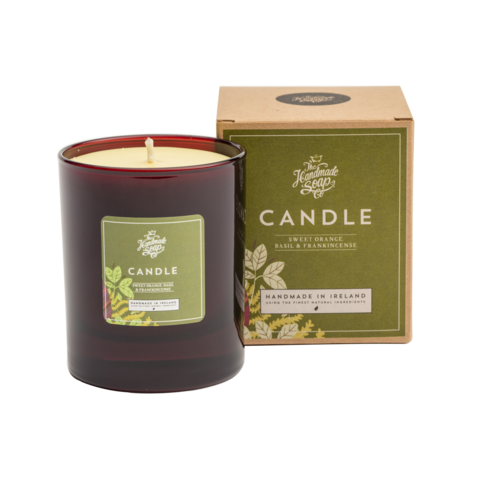 Made from 100% natural soy wax, this candle restores calm when life feels a little hectic. Paraffin wax is used in more than 95% of candle making done today, mainly because it is very inexpensive. Studies have shown that this petroleum by-product can release the same harmful carcinogens into the atmosphere as your car produces when petrol is burned. Cleaner burning – no toxins, carcinogens or pollutants which means it’s less likely to trigger allergies. No petrol-carbon soot like you get from petroleum-based paraffin candles. Longer lasting – soy wax burns cooler which means that you can enjoy your soy wax candle for generally 30-50% longer than a paraffin candle. Meaning less expense for you! Ingredients used come from plants & vegetables, coconut and pure essential oil. Sweet Orange Oil improves your mood. Diffusing orange oil in your home, can lift your mood and bring on relaxation. Orange essential oil has a direct effect on the olfactory system of the brain that quickly evokes emotional responses. Research shows that orange oil is both “uplifting” and “calming,” making it a great scent for brightening your mood in the morning or calming your nerves after a long day. Basil Oil, along with its function in relieving coughs, can also be used to treat asthma, bronchitis, and sinus infections. Therefore proving its benefits being present in the home. As well as this, Due to the calming nature of basil essential oil, it is widely used in aromatherapy. Regularly using this essential oil provides mental strength and clarity. Frankincense Oil and the fumes or smoke obtained from burning it have antiseptic and disinfectant qualities that eliminate the germs in the space where the smoke filters out.